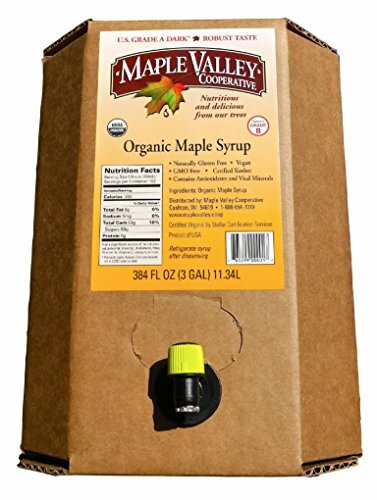 Maple Valley Cooperative, formed in 2007, is the largest organic maple syrup cooperative in North America. We represent more than 15 organic family farms reaching from the Great Lakes through the Appalachian Mountains. Our farmers are as dedicated to the fine science of crafting maple syrup as they are to practicing responsible forestry for the long-term health of the woods we work in. Maple Valley Cooperative believes in family-scale farming, fair wages for producers and employees, transparency, accountability, environmental leadership and ethical business conduct. The end result of these shared priorities is a socially responsible commodity: an organic maple syrup whose quality exceeds your expectations, reflects your values as a shopper, and deserves a fair price for both the farmer and yourself. Thank you for supporting small family farms. View More In Breakfast Foods. If you have any questions about this product by Maple Valley, contact us by completing and submitting the form below. If you are looking for a specif part number, please include it with your message.